I rang PC Specialist today and they said there was an option in the BIOS to disable the screen and this had been checked. I have never been into this BIOS so I don’t understand how that could possibly have happened. Anyway they have it on stress test and I can pick it up tomorrow. Except I have booked the van in tomorrow at Gateshead for 7 am to get all the brakes replaced! It’s their company policy to not let machines go out without a thorough stress test but I persuaded them to let me have it and finally I picked it up about 15:30 and headed up north. The first thing I did when I got parked was go into the BIOS, and work out what keystrokes I’d need to enable the screen in case that problem occurred again. I’ve never heard of a switch like that and have not a clue how it could have been changed. However it’s all done now so let’s hope it behaves. I docked at 11 am on Monday UK time and rang work and they agreed I could book the week in as holidays, and let them know if I got sorted before the end of the week. 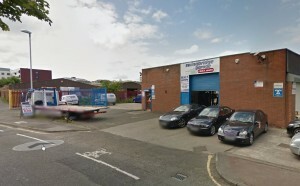 I then set straight off to Wakefield where PC Specialist are based. I rang them on the way and explained and was pleased to hear they’re open til 20:30 now so there was no rush. I got there for about 2 pm anyway and handed the computer in. They said if it needed a new screen it could take 2 weeks, so I set off for Oldham where there is an Argos and a PC World. I had to get a backup computer. Computer breakdown and the race to Calais. If you’ve read from the start you’ll know that right back in Autumn 2013 when I was readying the van for Europe and I had 2 tyres stolen that from that point there were non-stop problems that had to be overcome. It cost me over £3000 in the end for everything that needed to be done and to sort stuff out. Since coming to Italy the brakes failed in the Alps, Jack got stuck down a pipe, I had my wallet stolen with my bank card and driving licence, and now…my computer has broken, so I can’t work. I said if anything else went wrong I’d return to the UK as too much was happening and I was not only fed up with problems but was worried if something serious happened. However with a broken computer I’ve really got no choice because I’m due in work in about 10 hours and as I don’t speak Italian there’s only so much a local computer repair place can do. (Also the awful problems I’m having at work have come to a head. 🙁 )As mine’s under warranty anyway I decided to return to the UK immediately. There were some slightly scary bits coming back as the brakes were awful but it wasn’t as bad as I’d feared. I paid the toll to the Brenner pass which was only €24 for the 301 km trip, then the €8.60 toll through the Brenner pass. After that I turned off TomTom and made my own way on toll free roads so instead of the €110 I spent on the way in it was only €32.60. I need a vet to sort Jack out before I can return so I diverted once in Germany to find one that I’d found on my phone but it was shut. 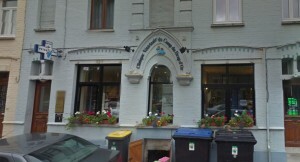 I checked another two in Luxembourg but one was a private vet with no access to drugs and the other was closed and I tried a final one in Belgium that was also closed. I’d been to one in Arques before near Calais, but they would not be open til Monday morning. I probably spent a small fortune ringing a friend to help me out as I’m no longer on Three network’s “Feel at home” package since leaving Italy. However my friend Ellie came up trumps and found me a vet in Ardres, about a half hour from the ferry terminal. I telephoned him and he (Maurice) said he’d be there at 9 am. Phew! What’s this going to cost me calling a vet out at 9 am on a Sunday morning! I got to Ardres late Saturday night after leaving Venice about 10:30pm Friday night, and calling in at Germany Luxembourg and Belgium on the way! There was a group of kids in the town centre, typical pre-teens and teens bored on a weekend and looking for something to do. So they were all happy to try and help out. A few knew the odd English word and a few understood my bad French and eventually we worked out that there was no vet in Ardres, yes I was from England and yes I knew the Queen and no I had never met Sting! Hmmm. Did I believe them? Not! So I set off driving around town and it only took about 10 minutes to find the vets. I was elated as it was directly across the road from a free car park. Result! I parked up and got some much needed sleep. The next morning I awoke in a panic. I checked the clock and it was 40 minutes past 9! I quickly rang Maurice and he said yes he was there waiting for me. I grabbed Jack and his passport and we ran across the car park to the vet’s but…it was all locked up and spiders webs all over the door that clearly had not been used for some time. I banged on the door and rang the bell but no answer. An old lady was trying to tell me in French that it was closed and I tried to tell her in French that I had just this second spoken to Maurice and he was supposed to be there. I stayed there and literally 3 minutes later here was Maurice. They had moved premises over a year and a half ago hahah so much for the internet! And so much for not trusting the kids either! I get him out of bed on a Sunday morning, make him wait 3/4 of an hour, then he has to come and find me, and that’s all he charges me? I was astonished to say the least and more than happy to hand it over. At least one thing has gone right for me! Now I can ring the ferry people and see what they say. I rang DFDS and explained my situation and they were very understanding however as I was booked to leave in about 6 weeks time and I wanted to reschedule for that same day, I would need to leave from Dunkirk and there was a massive surcharge of £74. I expected a surcharge but not that much, but hey, I need to sail that day so what the heck, I paid it without argument and was booked for 12 that day. I just had time to fill up with cheap diesel and get to the port. I did that and when I arrived at Dunkirk I was ‘told off’ for not checking in at least 1 hour before sailing. I simply apologised and said nothing else and as I looked at him stamping stuff and tapping his computer I knew somehow he was not going to let me on the ferry. It was that feeling I got when Jack fell off the harbour wall and into the sea at San Giuliarno. I knew it was going to happen. Sure enough he turned to me after a few moments and said “You cannot sail today. 24 hours must pass from the time your dog sees the vet to the time you sail. He was of course dead right. I’d totally forgotten but that’s the law and I knew it. 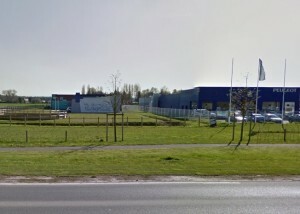 So I asked in a meek tone “What shall I do?” He advised going into DFDS’s office and seeing what they could do then looked away. He had nothing more for me. I found their offices and spoke to a lovely French girl who was very efficient and officious and said this was the law I must know that. I said yes but I had forgotten, was it possible to change my ticket yet again? She thought about this and finally agreed and suggested I telephone customer services. Back at the van I telephoned customer services. I got a lovely lady who understood everything easily and finally suggested I write in to head office so they could sort it out. She went off to find the address but I knew if I had to write in I would get nowhere. So I asked her in my nicest voice if she could find a supervisor to speak to but unfortunately he was on the phone. I suggested she pass my number on to him so he could call me when he was finished and she took it and said he would call back but I wasn’t sure he would. They never do. Anyway, less than 10 minutes later he called back. I explained everything all over again, and he said at the end I will simply refund your entire £74 that you paid this morning! DFDS have been my preferred ferry company since they took over Norfolk line and now I will not hear a word against them. So, I drove into Loon Plage which was pretty but empty. I drove around the countryside which was pretty but had nowhere to stop. Drove back to the ferry car park and took Jack for a walk along the waste land. I had about 20 hours to wait. What the heck, what an adventure. The Drain monster is exposed…it’s a Coypu! I know what the drain monster is! We went to the park this morning as usual and although as we approached we hear the usual thud/splash as they presumably jumped off the pipes and into them, when we got to the drain we could see them! The one in the west pipe has all of it’s tail out, and the one in the south pipe, top right of the video, you can just see it’s grizzly, grey old snout which moves slightly at one point. Anyway. 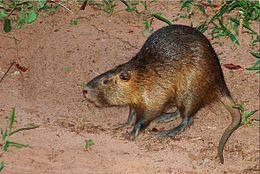 they’re not rats, and they’re not that giant really, I think they’re Coypus. I’m also willing to bet that this is what bit Jack the other week. The wounds he had were much larger than the rat bites he’d had in the past, and I’ve never seen a rat take a dog on. Even when cornered a rat may bite in passing as it tries to escape but it won’t stand and bite a dog twice. That’s what happened to Jack so I assume he met one of these down the first tunnel and it was protecting it’s own home. Note the snout and compare it with the one in the video. If you look at this one too you can see the tail. Compare it with the tail of the one in the video. You can see why they are thought of as giant rats, but apparently they can make great pets if born in captivity and tamed! Anyway, mystery over. 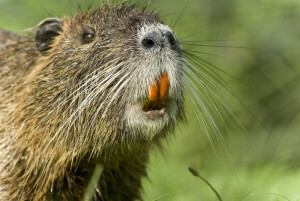 The drain monster is in fact…A Coypu. Drain monster – The Video! We’ve been back to the park several times now and observed the drain monster down there, although, observed means watching and seeing nothing but hearing those moo’s! I decided to video on my phone so you can hear them and even over Jack’s snuffling and panting you can distinctly hear 3 separate ‘voices’. I mean…miniature cows lost in the storm drains?